Officials move an engine recovered from the crashed Lion Air jet for further investigation in Jakarta, Indonesia, Nov. 4, 2018. The crash of a Lion Air plane last month has brought attention to the airline’s safety record as well as airline industry growth in Indonesia. All 189 passengers and crew members were killed in the crash of flight JT 610. 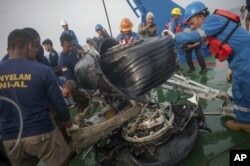 The plane crashed into the sea not long after takeoff from the Jakarta airport. Just before the crash, the pilot asked to return to the airport. An accident investigator and a flight tracking website reported that the aircraft had some problems on its previous flight. Its airspeed readings were not dependable. On Monday, investigators said the flight data recorder from the Boeing 737 Max 8 plane showed its airspeed indicator had been damaged during its final four flights. Boeing said on Wednesday it had sent a message to airlines reminding pilots about procedures for dealing with incorrect data from sensors. The United States Federal Aviation Administration also issued an order calling for changes on how pilots should react in such a situation. Rescuers use crane to retrieve part of the landing gears of the crashed Lion Air jet from the sea floor in the waters of Tanjung Karawang, Indonesia, Sunday, Nov. 4, 2018. The Lion Air crash demonstrates some of the difficulties that carriers in developing countries face. They must keep up with demand for air travel, while also aiming for established safety rules. With 129 million passengers in 2017, Indonesia is the world’s 10th-largest aviation market. It is expected to only continue growing. In the past 10 years, the numbers of domestic passengers there have grown three times higher, thanks to a combination of low ticket prices and increased personal incomes. The United Nations aviation agency reported the growth has been met with an air-accident rate that was two times the worldwide average in 2017. The accident rate in Indonesia is also higher than its neighbors in the Association of Southeast Asian Nations. Indonesian pilots are permitted to fly up to 110 hours each month. Many countries set the limit at 100 hours. Boeing reported last year that, around the world, a total of seven commercial planes had been damaged beyond repair. Two were in Indonesia. Neither was a Lion Air plane, however. Lion Air has expanded quickly since it started flying in 2000. The privately owned carrier captured more than half of Indonesia’s domestic market. It started offering flights to Thailand and Malaysia. It now flies more passengers than the national carrier Garuda Indonesia. In 2007, the European Union (EU) barred all 100 of Indonesia’s airlines from flying to its airports. Most of the country’s airlines are very small. The ban was lifted in 2009 for the national carrier Garuda Indonesia. The EU removed Lion Air from the ban in 2016. The rest of the airlines all came off the list in June of this year. Chappy Hakim is a former air force chief of staff and advisor to the Indonesian transport ministry. He told Reuters that he avoided flying with Lion Air or other Indonesian airlines. He only flies Garuda, which has not had a deadly crash since 2007. Lion Air Managing Director Daniel Putut disputed any question in connection to the carrier’s safety culture. 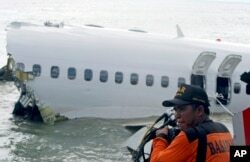 He said Lion Air followed the plane’s usual maintenance. The Indonesian aviation authority did not answer Reuters’ requests for comment about Lion Air’s safety record. FILE - A Citilink Airbus A320 approaches for a landing at Soekarno–Hatta International Airport in Jakarta June 14, 2013. Putut, a former pilot, told Reuters that Lion Air had worked hard to develop a safety culture after the Bali crash in 2013. He said thousands of Lion Air flights had taken off and landed without serious problems until last month. After the Bali crash, investigators recommended that Lion Air should make sure that “all pilots must be competent in hand-flying.” They also suggested teaching correct coordination for pilots and co-pilots. They also urged the aviation authority to make sure all of the country’s carriers did the same. Putut said Lion Air fully accepted those recommendations. Hai Do adapted this story for Learning English based on Reuters news reports. Ashley Thompson was the editor. maintenance - n. the act of keeping equipment in good condition by making repairs, correcting problems, etc.